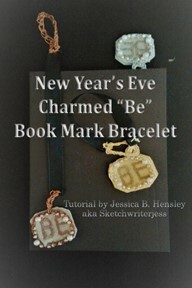 Charmed "Be" Bookmark Bracelet: Holiday version, last minute gifts. Bookmark Bracelet Charmed “Be”: Holiday Collection, From the 10 piece Charmed "Be" Collection of bracelets. 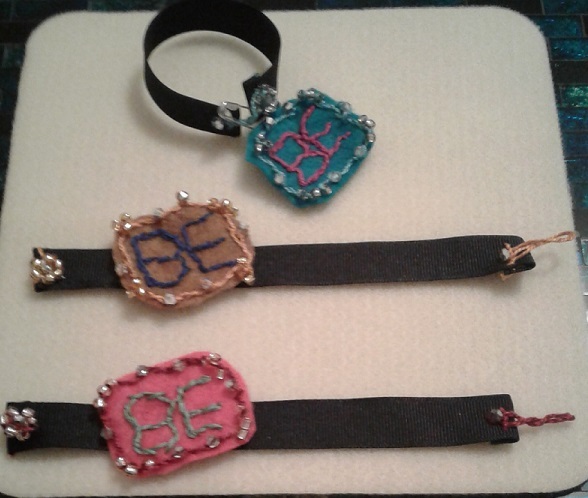 These Ribbon bracelets lie flat so that they can be bookmarks. The charm is removable and can be pinned anywhere a person wants. Also Hangs nicely as a charm from the bracelet. Let's get started. This list of tools and materials is long, but necessary to work on making these bracelets. Ribbon and 4mm Crystals are used for each bracelet. Bracelet A: Eco Fi Classic Felt Aqua, Silver Lined Beads 1952-87,Perle 5 #807 Peacock Blue, and Six Strand Floss #917 Plum. Bracelet B: Eco Fi Creatology Felt Copper Canyon, Silver Lined Gold Beads 1952-08, Perle 5 #976 MD Golden Brown, and Six Strand Floss #796 DK Royal Blue. Bracelet C: Eco Fi Classic Felt Choquant Rose, Silver Lined Light Pink Beads 1952-14, Perle 5 #815 MD Garnet, and Six Strand Floss #502 Blue Green. 1. Cut Felt into a 1.5” X 1” Square with 5” scissors. 2. 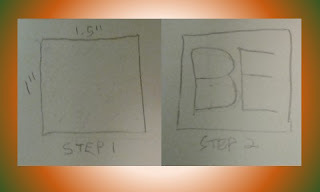 Draw the word “BE” in Capital Letters on the piece of felt with the fabric marking pencil. This is the wrong side. of your choice, Tie a knot at the end of the thread and sew onto the lines with “Chain Stitch” Embroidery. 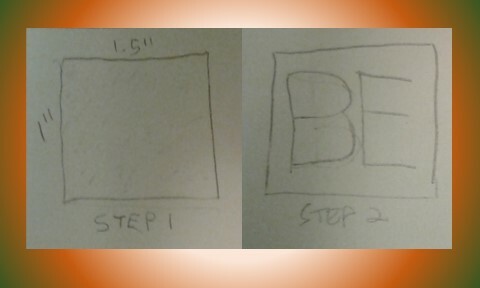 With the letter “B” it is helpful to stitch the outside lines of the letter and then sew through a couple chains until you reach the middle of the B. Then complete the chain stitch sewing. With the letter “E” it is helpful to stitch from the horizontal lines of the letter around the vertical line and then the horizontal line at the other end. 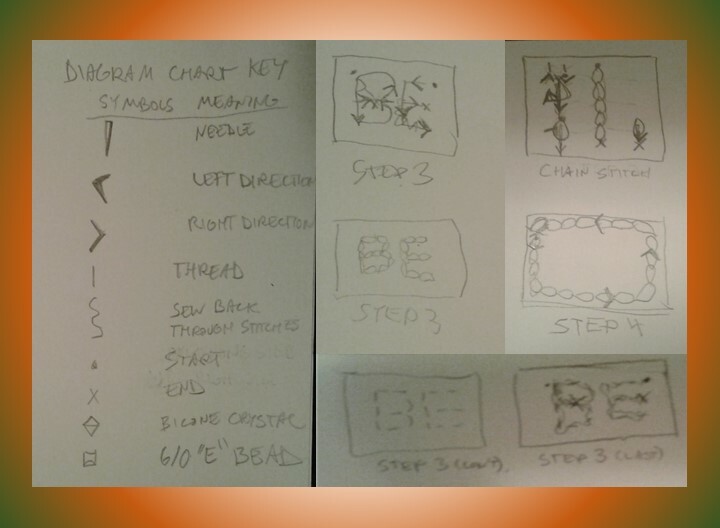 Sew back through the chain stitches to the middle horizontal line of the E and finish the chain stitch sewing. Then Flip Felt Over so straight stitches are showing. 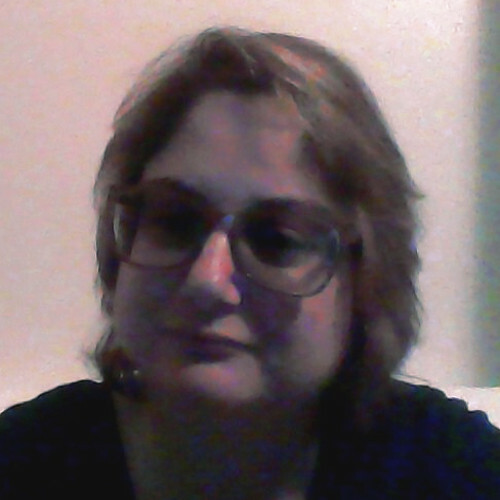 This is the right side. Whip stitch through stitches to create a rope texture. Finish off by sewing down through felt and knotting. 4. With Perle 5 Cotton Color of your choice, sew with “Chain Stitch” embroidery around the outside of the Rectangle. There should be 5 stitches along the width, 3 stitches along the height, and one stitch per corner. It is helpful to start the chain stitch midway so that it is easier to finish off the sewing. Finish off by ending last stitch through the right side and coming back up on the wrong side then knotting. 5. Flip the felt rectangle over to the right side. With Perle 5 Cotton, start with the second stitch from the upper left corner ,or right corner depending on handedness on the edge stitching. Pick up 4mm Crystal with needle and form a whip stitch by taking the needle with the bead on the thread and inserting it under the same stitch your sewing started at. Whip stitch next stitch. Repeat beading with the Crystal and whip stitching the same stitch to lock the bead in place. Whip stitch next stitch. Pick up three 6/0 “E” beads. Whip stitch back through the corner stitch for each bead to lock them in place, then sew back under corner stitch. Whip stitch over next stitch on height of Rectangle. Pick up a 4mm Crystal, Then whip stitch bead in place in same stitch to lock it in place. Whip stitch next stitch. Repeat as the first time corner was sewn, then reapeat as first row was sewn up to the last stitch of the horizontal row. Whip stitch the last stitch of row. Repeat as first time corner was sewn, then repeat as first vertical edge was sewn. Repeat as first corner was sewn for one last time, then whip stitch the next, last stitch. Finish sewing by sewing to wrong side and knotting. 6. Trim any edges of felt with the 5” scissors. Hold the felt rectangle vertical so you can see both sides of the felt and not trim any of the stitching done. 7. Cut ribbon to 7.5”. 8. Fold one end of ribbon once over, then once again so that edge is hidden. With Perle 5 Cotton Color of your choice Tack the ribbon closed with two stitches, sewn “Holbien” style. Flip ribbon over so fold is underneath. Then create a 1” high loop by starting loop by inserting needle in one stitch, pulling 2” of thread, then inserting needle through other Holbein stich. Insert needle through the two Holbein stitches 2 more times. 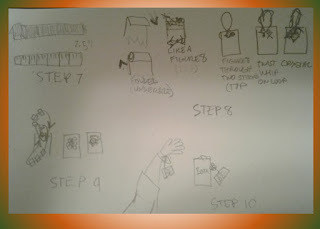 Go through one Holbein stitch once more. Whip stitch around the inside of loop to form a twisted thread texture that looks like a rope. Go through the other Holbein stitch one more time. Stich a running stitch so needle is back on top of bracelet. 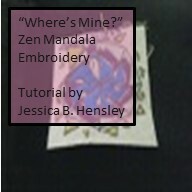 Pick up one crystal, whip stitch around the other stitches to lock bead in place. Go through with the needle to the back of the work. Finish off sewing with a knot. 9. Repeat with the other side up to the creation of the loop, but instead of creating a loop, a button will be formed with beads. Flip bracelet so that top is visible. Stitch through the top. Pick up a 4mm crystal. Stitch a running stitch ending up back at top. Pick up three 6/0 “E” beads on needle. Whip stitch through first Holbeing stitch, Then pick up three more beads. Whip stitch through second Holbein stitch. Then whip stitch as was done for the corners of the felt rectangle earlier for all six beads to lock in Place. Wrap thread around bottom center of beaded button 3 times to make it strong and also to lift it off the bracelet so that loop will stay in place when buttoned. 10. Close bracelet by putting the loop over the button and put a safety pin through the chains on the back of the charm any place you’d like. One chain will do. Hang Charm over loop when bracelet is closed. Can also be used as a corner bookmark when the bracelet is closed. If you want to make it a flat bookmark, cut the ribbon to 8” instead so the crystals don’t get trapped in the book. Wear at a holiday party or even year round. This bracelet is a classic. 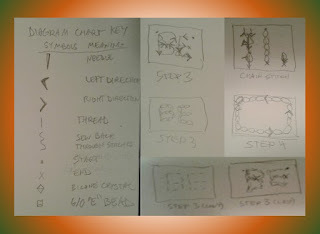 See you next week with a new tutorial for the New Years Charmed Be bracelet collection. 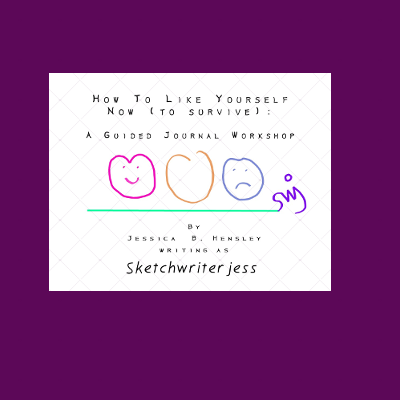 Would you like to check out more blog posts with tutorials? Looking forward to your other tutorials. Thank you. I look forward to creating more.